Okay, so back to the beginning... when we were picking out the carpet for upstairs my husband and I both decided we didn't want the master bedroom to get new carpet. It is the only bedroom on the first floor and the entire rest of the house already had tile. 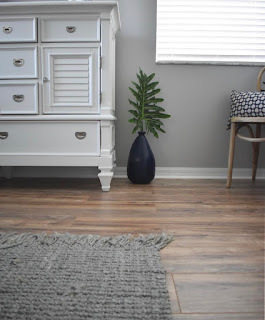 I personally did not want wood tile in the bedroom just because I felt the need for something "softer". Getting new hardwoods wasn't exactly in the budget so we decided to check out laminates. Now, let me start by saying I have never liked laminate. You all know as soon as we buy fixer upper properties we ALWAYS rip out the laminate. I just think it looks cheap. 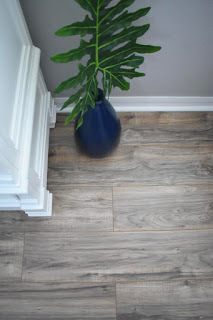 Well...I was so impressed with all the laminate floors they sell now! I guess I have never bothered to even look at them since we use wood tile so much. 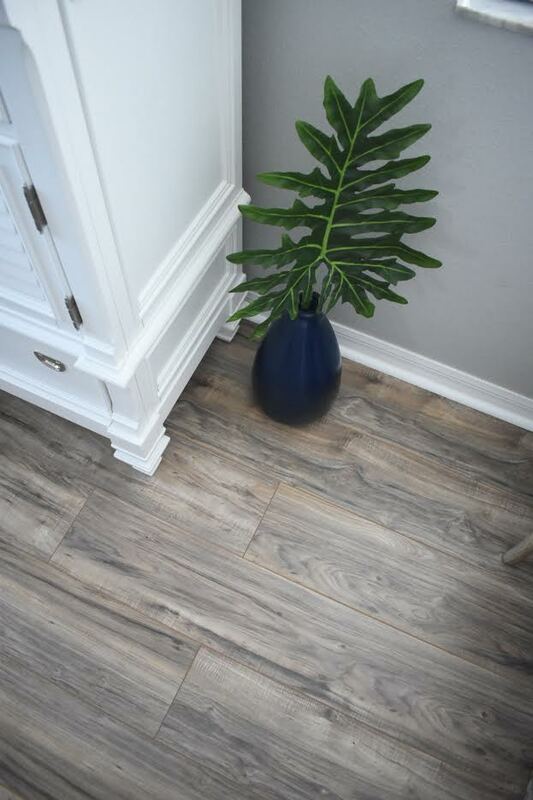 They come in planks of all sizes and even have real texture like wood! So like I always do I went around looking at samples and colors and reading reviews. 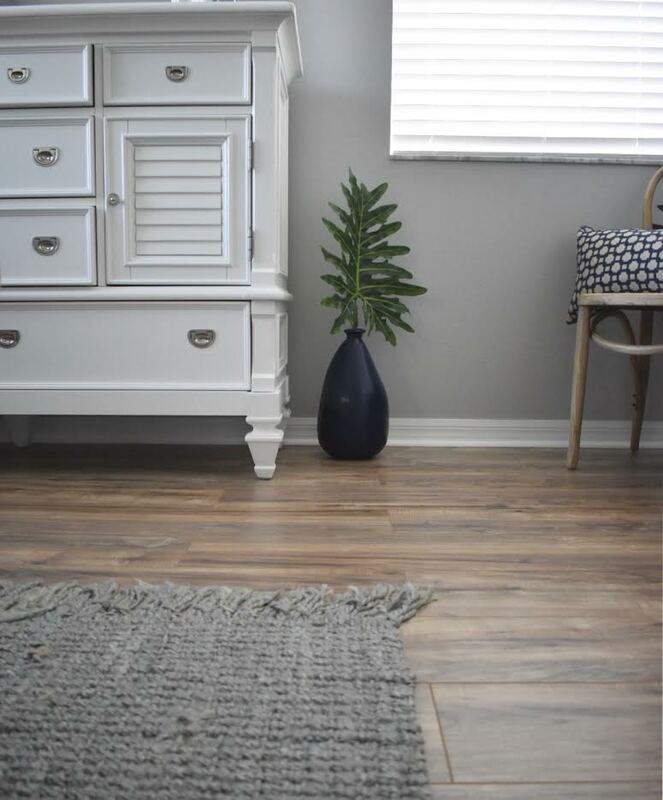 I kept comming back to this gorgeous wood laminate that people raved about online and in person was such a beautiful color with texture too! Now for the real kicker....the price is UNBELIEVABLE. No, for real...it's crazy inexpensive and such great quality! You can find the laminate at Home Depot (most have it in two colors) and the price is always just 79 cents a square foot!!! The pictures on the website make the color look a little off...you NEED to go see it in person at Home Depot. Also looking at everyone's reviews and pictures help get an idea of the actual color! My pictures are not edited as well. Just natural sunlight! 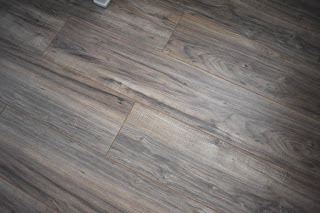 Wood Laminte floors Linked ....HERE. These are the TrafficMASTER Lakeshore Pecan 7mm thick X 7 2/3 wide planks! Both Home Depots I went to during this time had displays up of this color and a darker color..and plenty in stock! So if you are looking to remove some old carpet and your budget isn't too large I highly recommend these floors! I had no clue how to decorate my Christmas Tree. Thanks for sharing an affordable way to decorate my home and stuff. I appreciate this.